Horror movies are deliciously terrifying, titillating, and gripping. Once you start watching, you can’t stop no matter how scared you get! And getting really scared is the best part. Want to send shivers down your fellow partygoers’ spines the next time you go to a dress-up event? Here is a list of the top ten most terrifying horror movie villains of all time! Every kid is scared of the monsters in the dark at some point o r another. 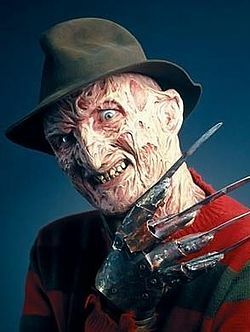 Freddie Krueger takes the terror one step further, haunting your sleep with his razor fingers and the threat that death in your dream translates to death in reality. Get ready to make your friends wet the bed!